We are always constantly looking to improve and refine our testing of everything Currently we are looking into improving our tests for forms in our PDF viewer. 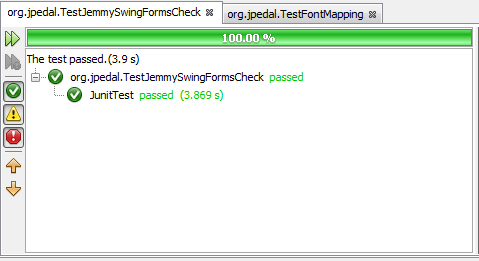 For the GUI testing we are using Jemmy, a library that comes with the NetBeans IDE and is very useful for testing Swing applications. NetBeans also comes with JUnit bundled in for unit testing that we also make use of. If you are writing a module and want to use Jemmy this is a good place to start. However if you want to use Jemmy with a project as opposed to a module you will need to remember to add it to the classpath. So we wanted to have our Jemmy tests run as part of our unit testing but there wasn’t much in the way of documentation on how to do this. Adding the @Test annotation and making use of JUnit’s assertEquals() and fail() if needed. One thing worth mentioning is that when reading/writing text files for loading test data it’s important to make sure you explicitly set the encoding. As I found that when running Jemmy as a standalone test, not using the test option in NetBeans and not as part of a JUnit test, it used a different default encoding to when using the test option and running it as part of our unit testing. If you would like to learn more be sure to check the “NetBeans article Index�? series. These articles, explore NetBeans in different ways, and give useful hints and tips, to our how-to’s, experiences overview and user experiances of the NetBeans IDE. What I like about for instance Ranorex is the combination of recording and manually editing the generated script. Recording is fast, and making changes to the test cases to reflect software changes can be done without re-recording. And run it from Jenkins if you want to. Jemmy just looks a bit time consuming to me. Is there going to be a JavaFX version of Ranorex?